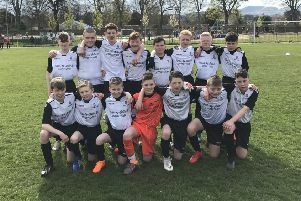 Barca Milton 97 romped their way to the quarter-finals of the RJM Sports East of Scotland Cup with a 4-1 victory over Dunblane Soccer Club. Barca will meet fellow LEAFA club Edinburgh South Vics in the last eight after the draw was made yesterday morning. The Championship outfit took the lead following a fine team move, with striker Charlie Adams finding the top corner after a one-two with strike partner Jon Laidlaw. It was soon 2-0 when Andrew Donaldson’s long throw in wasn’t dealt with by the visiting goalkeeper and midfielder Jason Watson had the simple task of passing the ball into the net. Dunblane hit back soon after, but Barca restored their two-goal advantage ahead of the half-time whistle, with Watson again finding the net from a Donaldson throw in a carbon copy of his first effort. The visitors couldn’t deal with the threat posed Donaldson’s throw and that was their downfall once again for the fourth and final goal as the visiting keeper inadvertently put the ball into his own net when attempting to catch the ball. Elsewhere, Edinburgh South Vics progressed to the quarter finals thanks to Ryan Moore’s extra-time winner after the 90 minutes ended 0-0 against Alva. Sandys crashed out of the East of Scotland Cup after extra-time, losing 6-3 to Pennies AFC. Meadowbank maintained their five point lead at the top of the Championship with a 4-1 victory at home to bottom club Armadale Thistle – their fourth win in a row. The hosts romped to a three-goal lead inside 25 minutes as the visitors couldn’t cope with their attacking threat. Goalkeeper Aaron Griffiths’ punt wasn’t dealt with by the Armadale defence, landing just right for Mark Low, who shot first-time with a left-footed half volley from the edge of the box. The second goal arrived on 20 minutes, with Paul Martin playing a neat one-two with Low, before the former was brought down by an Armadale defender inside the area. Martin then stepped up to convert the spot-kick. Martin then set up Ross Stenhouse to tap home for number three after good play down the right side from Aaron Gosman. Armadale pulled a goal back before the break from a corner-kick, but a comeback was never on the horizon and substitute Euan Bell restored their three-goal advantage with his first touch after getting on the end of Stenhouse’s cross. Elsewhere, Tranent moved into the semi-finals of the Miller Cup with a 1-0 win over Linlithgow Thistle, with Anton McKillop firing the only goal of the game.